Since the advent of railways in India, train journeys have been synonymous with enigma and allure. It was common practice for the British aristocracy and Indian Royalty to travel in the luxury of their private luxury trains. This legacy of princely sojourns across the wilderness, mountains and deserts of India is now continued by the Deccan Odyssey. 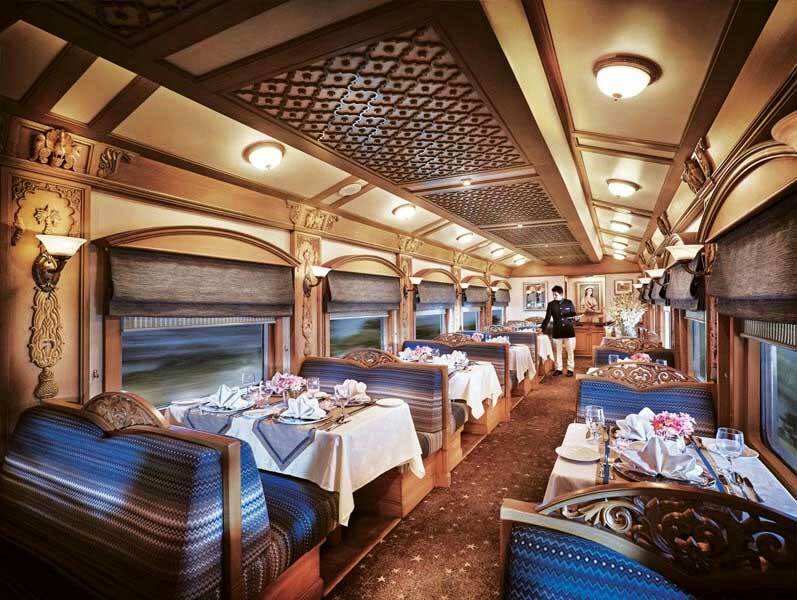 Fondly called as ‘India’s Blue Train, the Deccan Odyssey take you on a voyage across the magnificent landscapes and territories of India. Sail into an age of romance and royalty, discover the soul of this incredible country. From world heritage sites, forts and palaces to an array of cultural experiences crafted exclusively for you. Carving its way across the very heart of India, the journey with Deccan Odyssey Train showcases the best sun-kissed beaches of India, exquisite forts and palaces built with indelible accomplishments along with a blend of religious-spiritual aura. The recent addition in the worldly recognised itinerary of Deccan Odyssey includes Indian Odyssey, Maharashtra Splendour, Indian Sojourn, Hidden Treasures of Gujarat, Jewels of the Deccan and Maharashtra Wild Trail. Each journey on the Deccan Odyssey is an exploration of India’s diversity, exotic locales and discovery of her timeless traditions; where you breathe in the vibrancy, sounds and colours of India’s cities and her countryside. Mysteries, intrigues unfold as the train snakes her way through royal cities showcasing the opulence and extravagance of the palaces, the traditions and culinary wonders of cities and villages well protected from the sands of time. This ‘Blue Limousine on Rolling Wheels,’ endows a superlative experience, garnering the dreams of many with a touch of magical reality. So be it a UNESCO world heritage site, palatial residence or the vineyard, all these aforementioned destinations are revealed with a majestic touch. 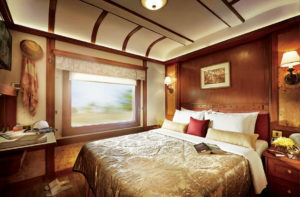 The Deccan Odyssey Train Tour in India flaunts royalty, magnificence and re-discovery with excellence. The Great India Train journey aboard the Deccan Odyssey is one of the most exciting ways to experience the Culture & Heritage of India. Each journey on the Deccan Odyssey train is an exploration of India’s diversity, exotic locales and discovery of her timeless traditions; where you breathe in the vibrancy, sounds and colours of India’s cities and her countryside. Mysteries, intrigues unfold as the train snakes her way through royal cities showcasing the opulence and extravagance of the palaces, the traditions and culinary wonders of cities and villages well protected from the sands of time. The Deccan Odyssey treats each of their guests to unprecedented luxury on wheels with the help of 21 superlative, luxury coaches. Out of these, eleven are guest cabins. Each coach has four cabins. In order to ensure a comfortable journey, each Deccan Odyssey cabin is well-equipped with a range of modern amenities. 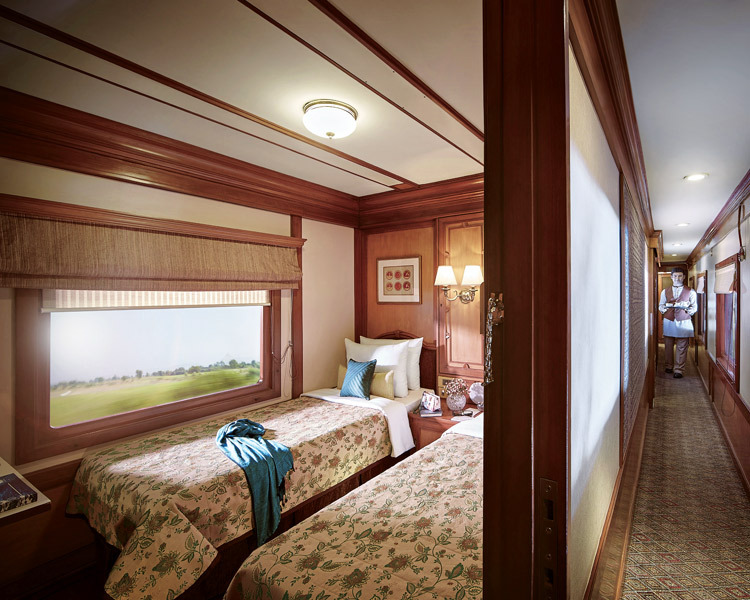 They are spacious, elegant and seamlessly designed to radiate the various eras of the Deccan dynasties. 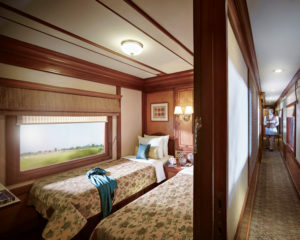 The Deccan Odyssey luxury train is also home to four splendid Presidential Suites. Each of these sophisticated suites is exquisitely designed and comes with all modern facilities. We also offer a specially equipped cabin, for the comfort of our differently-abled guests. 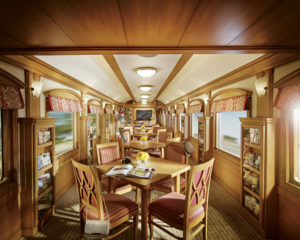 The ultimate aim is to ensure all guests make the most of their Deccan Odyssey journey. The Deccan Odyssey’s two gourmet restaurants, Waavar and Utsav have been designed to keep the element of Indian royalty intact. The chefs ensure the cuisine keeps pace with the train’s journey, by creating local specialties of the very state that the train travels through. So you discover every location with all your senses, including your taste buds! Each meal also includes an International menu to choose from. In order to further enhance the gourmet experience, Deccan Odyssey presents travelers with a well-stocked bar – Gateway. This is the ideal spot to meet and know your fellow travellers, over an evening drink & snacks. After a long day of exploration, head to Deccan Odyssey’s wonderful spa “Ayush”. The salon’s well-trained masseurs, incorporate ancient Indian techniques to help you relax your body and rejuvenate your mind. The Deccan Odyssey’s two gourmet restaurants, Waavar and Utsav have been designed to keep the element of Indian royalty intact. Our chefs ensure the cuisine keeps pace with the train’s journey, by creating local specialties of the very state that the train travels through. So you discover every location with all your senses, including your taste buds! Each meal also includes an International menu to choose from. In order to further enhance the gourmet experience, Deccan Odyssey presents travelers with a well-stocked bar – Gateway. This is the ideal spot to meet and know your fellow travellers, over an evening drink & snacks. After a long day of exploration, head to Deccan Odyssey’s wonderful spa “Ayush”. The salon’s well-trained masseurs, incorporate ancient Indian techniques to help you relax your body and rejuvenate your mind. If work requires your time and attention, then our conference car, “Pankh” will take care of all your business needs. Equipped with the latest facilities, it ensures you manage your work efficiently even while you’re away travelling. While you’re on the Deccan Odyssey, our well-organized staff ensures your every need is taken care of. For an incredibly relaxed journey, valets are accessible round-the-clock; one for every Presidential Suite and one for each coach. 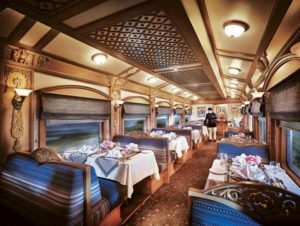 The huge success of the first Indian luxury train ‘Deccan Odyssey’ paved the way to the birth of another deluxe rail journey in the south western part of the country. A brainchild of Maharashtra Tourism Development Corporation (MTDC), Deccan Odyssey is the fruitful result of the relentless efforts of its visionary. The first proposal to launch a deluxe train tour in Maharashtra was made in the year 2001 and accordingly the MTDC and the Indian Railway Ministry signed a MOU in the same year to turn this proposal into a reality. The Integral Coach Factory (ICF) got a green signal from the Railway Board to start the work on Deccan Odyssey in the year 2002. 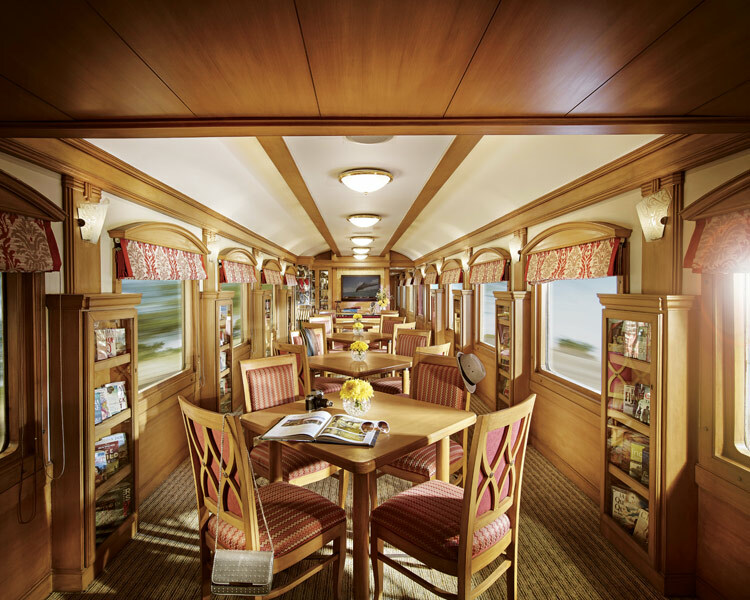 It took ICF members around five months to finalize the design of this luxury rail in India. It was not a cake walk for the designers to give shape to their vision and thus few more months have been spent on its construction. The later part of the year 2003 saw the completion of this blue Limousine on wheels and not to mention, the embodiment of the designs stole everyone’s vision when it was placed into the tracks. Aligned with the best royal trains of the world such as Blue Train of South Africa or Orient Express of Europe, Deccan Odyssey was suffused with every modern facility that contributes towards making each luxury train tour to Maharashtra comfy and deluxe. After a long day of exploration, head to Deccan Odyssey’s wonderful spa “Ayush”. The salon’s well-trained masseurs, incorporate ancient Indian techniques to help you relax your body and rejuvenate your mind. If work requires your time and attention, then our conference car, “Pankh” will take care of all your business needs. Equipped with the latest facilities, it ensures you manage your work efficiently even while you’re away travelling. While you’re on the Deccan Odyssey, our well-organized staff ensures your every need is taken care of. For an incredibly relaxed journey, valets are accessible round-the-clock; one for every Presidential Suite and one for each coach. ON BOARD THE Deccan Odyssey.